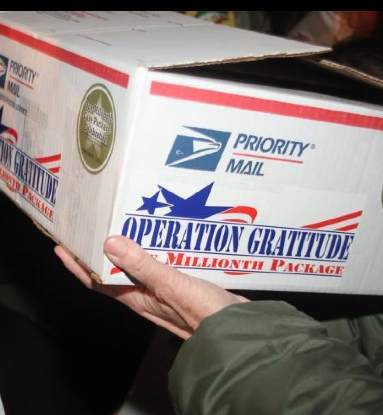 Volunteers at Operation Gratitude, the non-profit military and veteran support organization, assembled its milestone One Millionth Care Package to the cheers of thousands of supporters assembled for the celebration Sunday. To heighten the excitement, corporate sponsors donated huge prizes that will be part of the hand-packed delivery. The package, in route overseas, will bring to the lucky recipient the keys to a brand new Ford F-150 truck. Military brass, elected officials, active and retired service members and 4,000 volunteers gathered to celebrate the historic package assembled under a large tent adjacent to the California Army National Guard Armory. Three previous Operation Gratitude Milestone Package recipients were also in attendance: Sgt. Shaun Gallagher (300,000th package); Sgt. Eric Rodriguez (750,000th package) and Sgt. Samuel Mancilla (800,000th package). Six World War II Veterans were honored guests, including a Tuskegee Airman, Lt. Colonel Bob Friend, and Ms. Bea Cohen, the oldest living female World War II Veteran at 103 years old. Alonside the pomp, two assembly lines were in full swing, producing 3,000 care packages in just two hours. In addition, the activities included a letter writing area with custom printed holiday cards for the troops. Always a highlight of Operation Gratitude milestone package celebrations, the reveal of the special gifts for the One Millionth Care Package brought gasps from the audience. Upper Deck, producer of sports cards and authenticated sports memorabilia, presented a poster hand-addressed to the One Millionth Package Recipient, signed by Tiger Woods. Best Buy revealed two Home Entertainment Systems–one each for the Millionth and the One Millionth & One packages. The systems included 55 and 32-inch Insignia TVs, as well as wireless speakers, digital cameras, a plethora of accessories, and iPads. And, Living Essentials, the distributor of 5-hour ENERGY shots, unveiled their donation of a Ford F-150 pickup truck. The vehicle will be delivered to the soon-to-be-revealed service member upon returning home from deployment next Spring. The secret overseas delivery of The One Millionth Care Package, containing symbolic keys to the Ford F-150 and certificates for the other gifts, will be revealed to the public in the coming week. You can watch their Facebook page here, and volunteer at their website: www.OperationGratitude.com.